Pardon my silence, loyal readers. It’s that time of year, when freeze warnings pop up for my region, and Wonder Spouse and I must scramble to prepare our yard and gardens for their winter sleep. First up last weekend was the water feature in our front garden. It was full of murky greenish water. We knew we’d need to catch and relocate the two Green Frogs who lived there most of the summer, but we were surprised to find that about 50 or so tadpoles were still alive and well and not yet ready for metamorphosis. Some had sprouted back legs, but most were still fully tadpole in form. We spent over an hour painstakingly scooping up tadpoles as the pond drained to reveal their hiding spots. I have no idea what species of tadpoles we moved, but they seemed to be at least two different sizes, colors, and shapes. Frogs and tadpoles were relocated temporarily to a bucket filled with pond water. When we were sure we had all of them, Wonder Spouse carried them down to a small pond on our floodplain, where he gently poured them out. We know it’s tricky for them to make their way into territory already claimed by other amphibians, but we figured at least this way they have some chance to survive. They can’t stay in the water feature all winter. If we happen to have one of our colder winters, the water would freeze throughout, cracking the pond, and killing anything trying to overwinter in it. 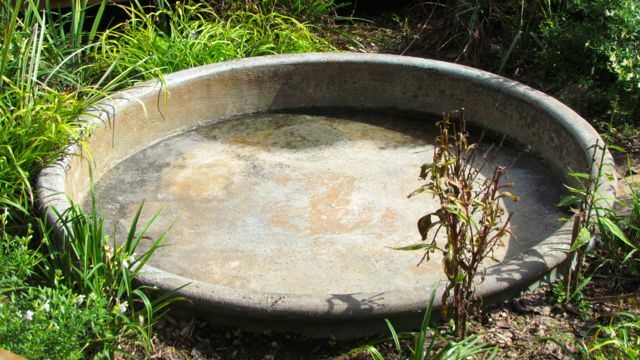 When Spring warms the air, we are always surprised at how quickly frogs and toads find the newly re-filled water feature. It is a favored courting and egg-laying spot in our yard, probably because it is more protected from predators than the pond or creek on the floodplain. Nothing says spring like a raucous nighttime serenade by amorous amphibians. Reptiles in our yard move themselves to their winter homes. Many seem to prepare for winter hibernation by shedding their skins. We found several two-foot-plus-long recently shed skins from our resident Black Racers. One lives in the rock wall holding up the beds around my greenhouse. Another lives somewhere beneath our front deck, and I know several others nest somewhere on or near the floodplain. I encounter them on patrols every few weeks during the warm months. 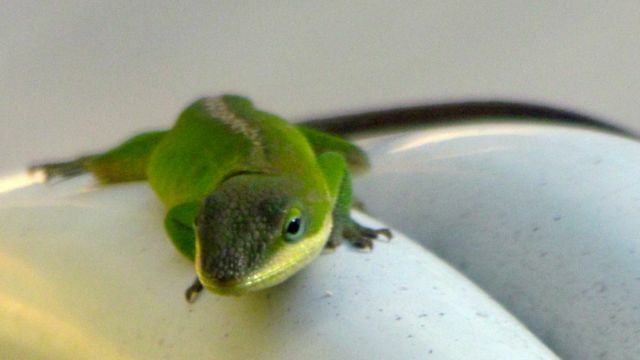 Suddenly visible in great numbers again are the Green Anoles. 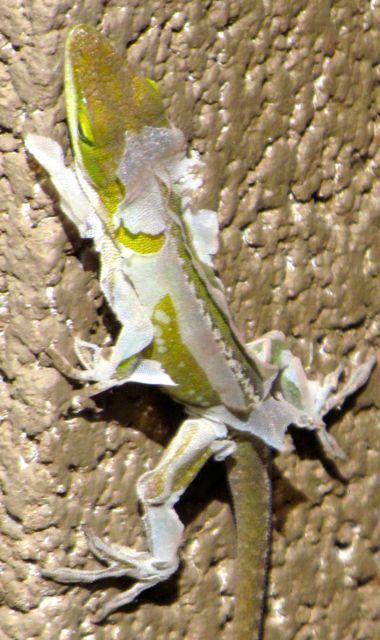 About a dozen of these color-changing lizards spent last winter living around the west-facing front of our house and the south-facing wall of our garage. They dispersed when the weather warmed. I’d occasionally meet one hunting among my flowers or vegetables, but otherwise, they seemed to have disappeared. But now, my goodness, they are not only back, they have multiplied. It took me a minute to realize why this lizard looked so odd. Another anole seemed interested in the shedding process of his garage-mate. 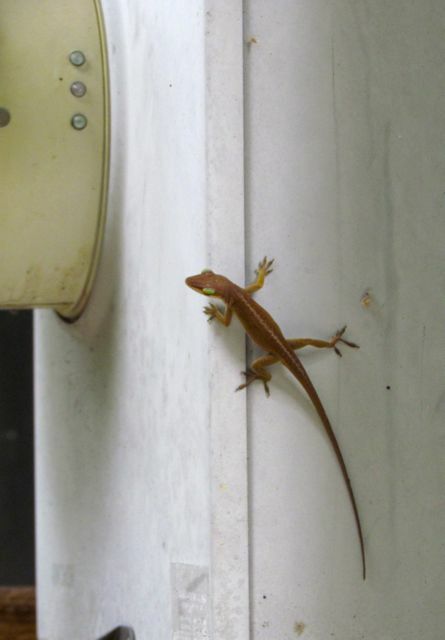 At least a dozen anoles have reappeared along the west-facing entry to our house. 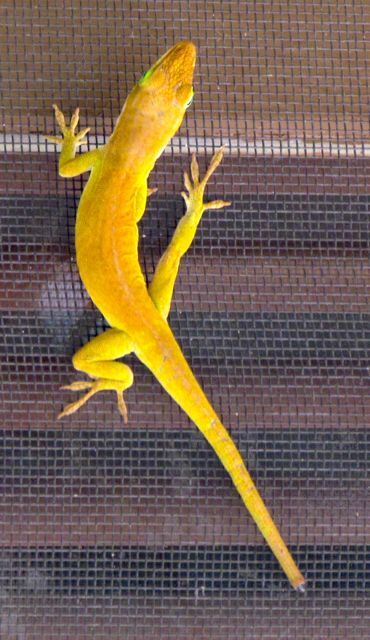 We now must check our screen doors before opening inner doors, lest a dozing anole drop into the house. A recently acquired pot of chrysanthemums by the front entry has been adopted as a favorite resting spot. 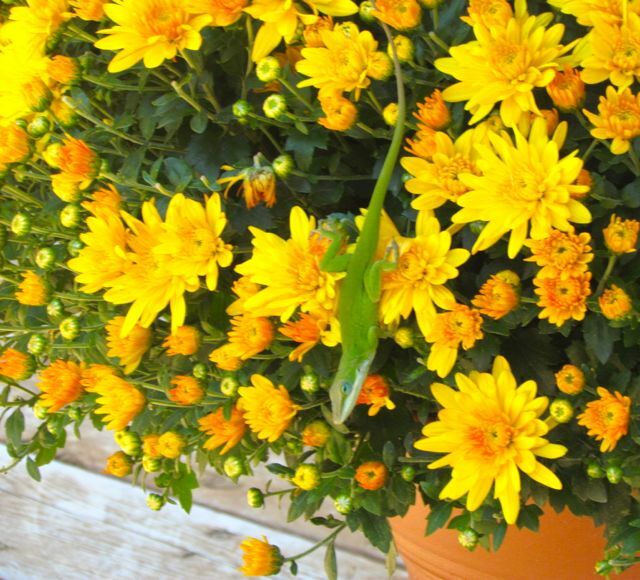 Insects attracted to the flowers are likely providing handy snacks for this clever reptile. Every warm sunny afternoon, they emerge from their hiding spots to catch a few rays. On the kitchen window screen. Checking out the electric meter. 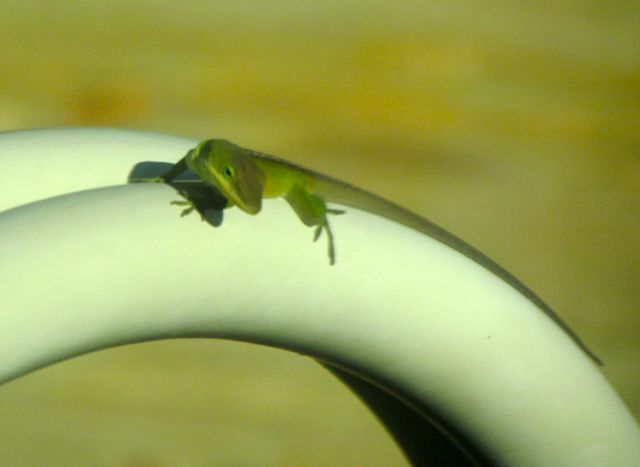 This year, I’ve spotted a least three anoles enjoying our back deck, which faces south and is protected from west winds. They even seem to be enjoying our deck chairs. The metal arm of this chair warms in afternoon sunlight. Of course, freeze warnings mean it’s time to relocate all summering potted plants to their winter quarters in the greenhouse. 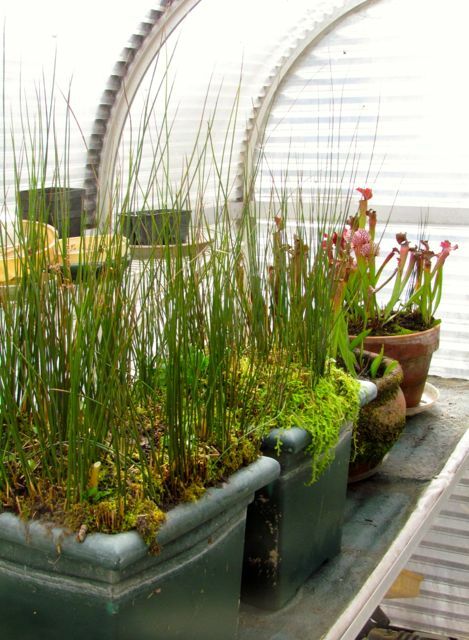 The pitcher plants and sedges that live in pots inside the water feature all summer get moved into individual trays that hold water. I refill them regularly, so that their favored moisture levels are maintained. Pond plants don’t mind the transition as long as I maintain their moisture levels. All the potted plants that spend their summer beneath the shelter of the Southern Magnolia also move into the greenhouse, along with pots of still-flowering annuals on the back deck. By the time we move in the deck plants later today, the greenhouse will be very full. It’ll be a full house after I move in the deck plants later today. A packed greenhouse is actually better for the plants. Humidity levels are easier to maintain, and any insects or other critters who succeeded in hitching rides on the plants don’t usually cause much trouble. One year, a Cope’s Gray Treefrog snuck in for the winter. He just dozed quietly through the cold months until I moved him and his pot back outside the following spring. 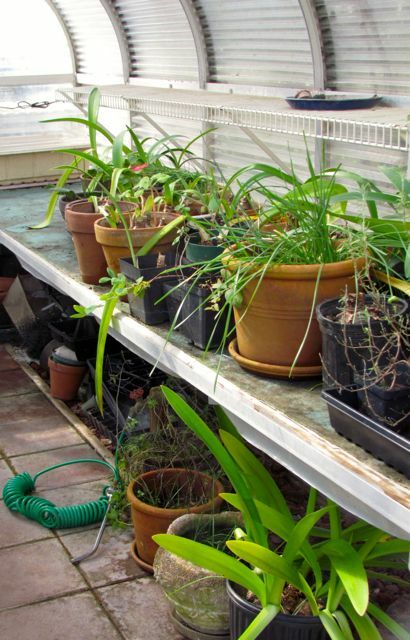 I keep my greenhouse cool all winter, so that plants mostly sleep but don’t freeze. The plants growing on our five acres don’t need any help from me to prepare for winter. The Tulip Poplars have already dropped most of their leaves. Berries on the native dogwoods are almost gone, thanks to flocks of marauding American Robins and hungry Pileated Woodpeckers. They have moved on to the Southern Magnolia. Most of its seed cones are open now, revealing tasty red fruits coveted by wildlife of all kinds. I can lose an hour quickly this time of year just watching birds and other critters argue over magnolia fruits. 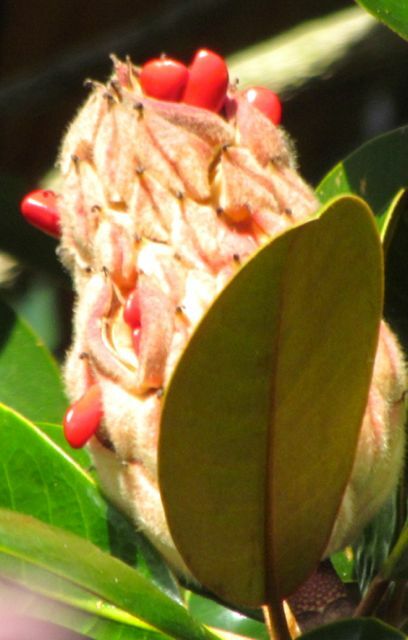 Scarlet fruits of the Southern Magnolia are irresistible to wildlife. Fall color grows more glorious daily, of course. I’ll show you some examples soon. Right now, I’ve got to get the potted plants on the back deck tucked into the greenhouse. The weather seers are calling for a freeze tomorrow night. At my house, that likely means lows in the mid-twenties. Time to break out the extra blanket for the bed, find my cozy winter slippers, and wait for next season’s seed catalogs to start filling my mailbox. The Pineapple Sages are always in full bloom when the first freeze hits them. But departing hummingbirds and I appreciate every scarlet blossom before it is browned by ice. 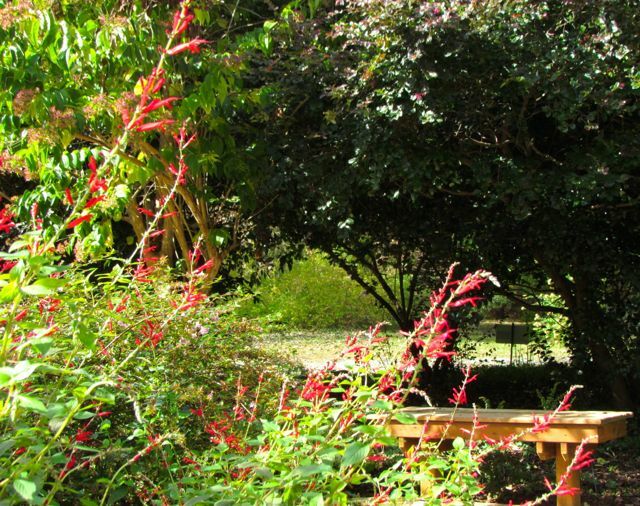 This entry was posted on October 24, 2013, 10:22 am and is filed under Favorite Plants, Greenhouse growing, Native Wildlife, piedmont gardening. You can follow any responses to this entry through RSS 2.0. You can skip to the end and leave a response. Pinging is currently not allowed.